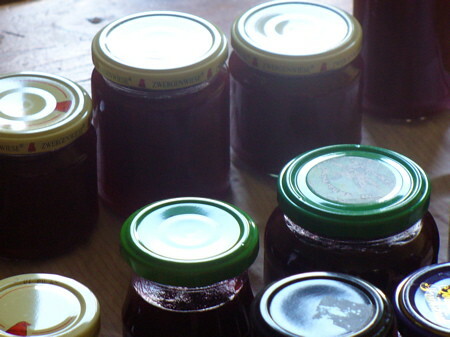 I didn’t know that there was a different way of making jam until I started reading American blogs and all I heard was “botulism” and “canning equipment”. Oh, and “sterilizing”. 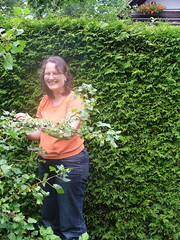 Then the lovely Brenda Dayne talked about her quest for self-made jam on her podcast, and I thought I’d rather post this on my blog than jam up her comment-section. I was sure I already had written a post about how we make jam but all I could find were a few pictures of jam-making in a post about my yoga bag. So, this time I hired my husband as a photographer and set out to document our jam making process. It is, by the way, really easy. The first step, the one that might be a stumbling block for a newbie, is to collect jars. Every time we buy jam, or mustard, or tomato sauce or anything I put the jar and the lid into the dishwasher, and then it goes into a big cardboard box in the basement. We go through a lot of jars here because my mother-in-law makes jam to sell for charity each year. Otherwise we’d have enough jars to store several years worth of jam. If you’re fancy and wading in money you might go and buy jam jars though I can’t tell you where to find some, I only once heard of somebody who did. We were lucky enough to make it indoors again before the next rain. Also, I have to add that since my mother-in-law is the champion of jam makers we only picked the remnants. After my son had gone to bed I washed and cleaned the fruit. 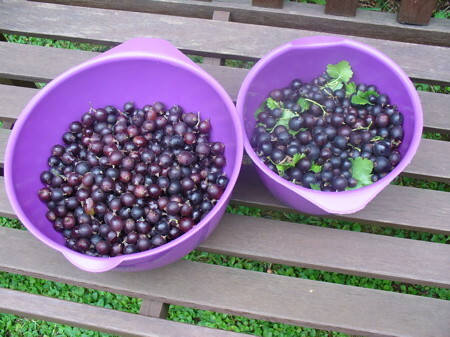 And I borrowed a machine for pitting the cherries. 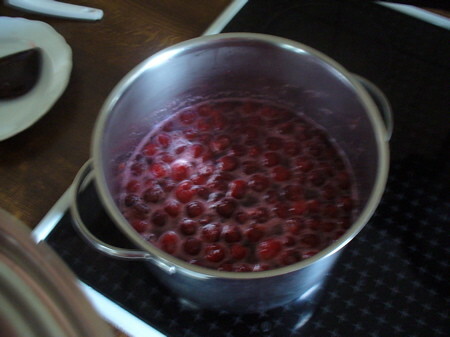 About two hours later I put the cherries (now mostly without stones) in one pot after weighing them, of course, the berries in the other, measured the canning sugar (that’s the important part, you know that sugar with, um, sugar and pectin), stirred everything and went to bed. (Imagine a picture of sugarcoated berries in post here. It was dark, it was ten in the evening and I didn’t take a picture.) The pots are our usual cooking pots, it’s only helpful when they are big so that the jam only fills about half of the pot. But you can do it in a smaller pot if you are careful. 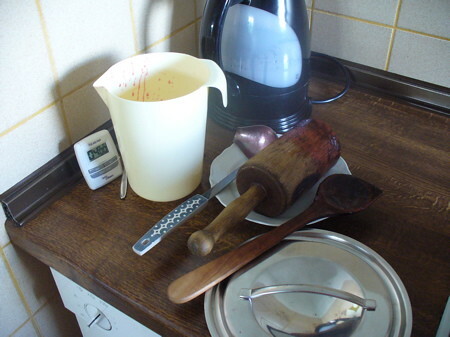 Only it’s harder not to spill boiling jam on your stove. Note that I didn’t cut or mash the fruit in any way, we like our jam with lots of pieces of fruit. Also, traditionally you’d use only the berries juice for jam but my husband likes to have the whole berries in. The next time you have a bit of time you go down into the basement and fetch the box of jars and the pots of sugary fruit. 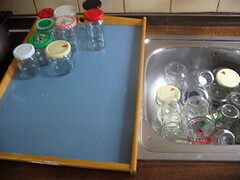 Then you wash the jars, you rinse the jars (you don’t want to have detergent in your jam, don’t you? ), and then you put them into very hot water. That helps with them not exploding when you put the jam in, they are already very warm. I was determined to make strawberry jam this year, but it rained during the entire month of June, which is when strawberries ripen here, so there was no picking. Yesterday I came home with about seven pounds of blueberries, but I love to eat them so much I have a hard time committing any of those to a jar, even though i will regret it some January day when i have nothing for my toast. Ha! Wir haben letzten Freitag Marmelade (oder eher Gelee, ich weiß nie den Unterschied) gemacht. 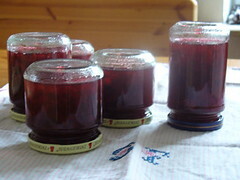 Schwarze, weiße und rote Johannisbeeren, Stachelbeeren und ein paar verirrte, wilde Himbeeren. Sehr lecker.